The growth of China’s household debt reflects a natural evolution in financial sector deepening and has grown in two waves. The first occurred during the late-1990s following major financial reforms and the privatization of China’s housing stock. 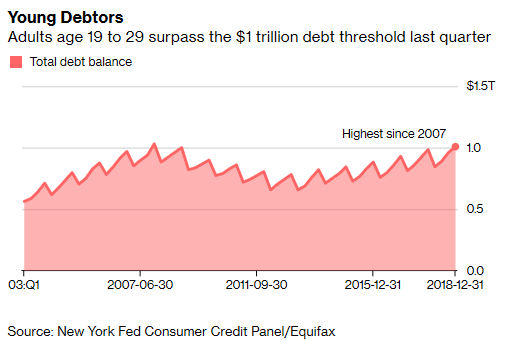 The second wave began in the wake of the global financial crisis and has witnessed much more rapid growth, with debt increasing by nearly $5.7 trillion, or nearly 30 percent of China’s GDP. In fact, household lending overtook corporate borrowing in early 2018 to become the largest driver of aggregate loan growth in China. New household lending now accounts for roughly half of new loans. 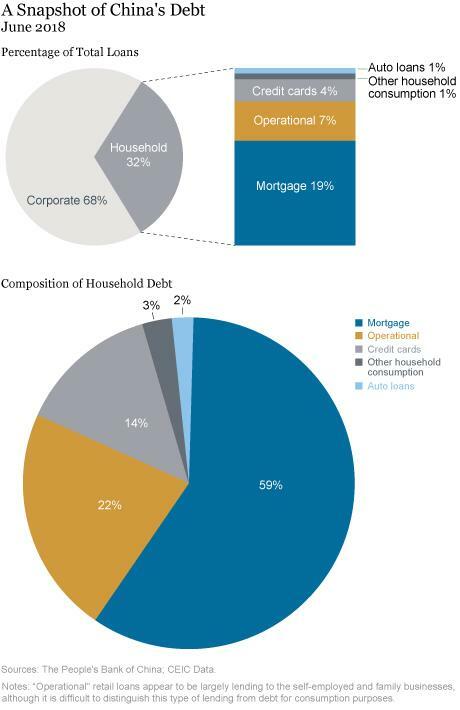 As illustrated in the upper panel of the chart below, the majority of household debts in China are residential mortgages, although other forms of consumer credit are also large and growing rapidly. The lower panel of the chart shows the shares of household loans by lending category. As of June 2018, outstanding mortgage loans accounted for close to 60 percent ($4 trillion) of total household debt. Mortgages comprise roughly 19 percent of bank loans in China (compared to 30 percent in Korea and 23 percent in Japan). Growth in mortgage lending has averaged 27 percent per year over the past three years, although the pace of growth has decelerated gradually over the last year as Chinese authorities have tightened macroprudential policy. China’s credit card debt is part of “consumption loans,” which comprises 14 percent of total household debt, and is now the fastest growing component. Additional consumer credit not captured in the official data include online peer-to-peer lending platforms, other forms of microlending and consumer finance, and informal lending. Peer-to-peer lending platforms, which have increased rapidly in recent years, have also been the focus of heightened regulatory scrutiny recently due to a series of failures by some platforms. 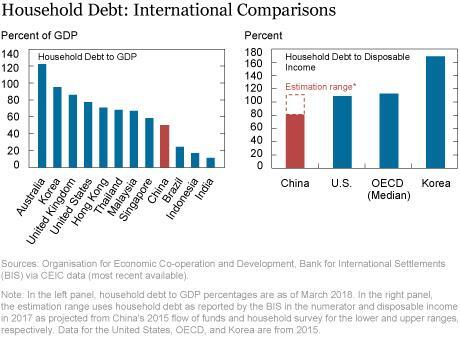 How Does China’s Household Debt Compare with Other Countries? 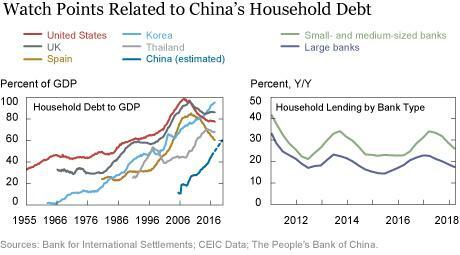 China’s household debt relative to its GDP and aggregate household disposable income is broadly comparable to international peers, but this follows a period of rapid growth from initially low levels. For example, according to statistics compiled by the Bank for International Settlements (BIS), China’s household debt-to-GDP ratio now stands at around 50 percent. 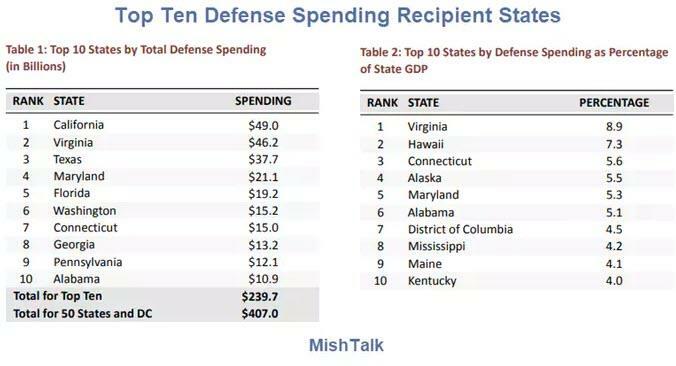 As illustrated in the left panel of the chart below, this is still fairly modest compared with most developed economies, but above most emerging market economies outside of Asia. Within Asia, China is rapidly catching up to Japan (57 percent), but is further behind Thailand, Malaysia, and Hong Kong (all close to 70 percent), and well below Korea (95 percent). However, China’s ratio increased by nearly 30 percentage points over the past decade, a much larger increase than witnessed in virtually all other countries, including Korea, which increased by about 23 percentage points. Debt ratios relative to households’ disposable income are arguably better measures of the aggregate burden on households, but are more difficult to compile on an internationally comparable basis. 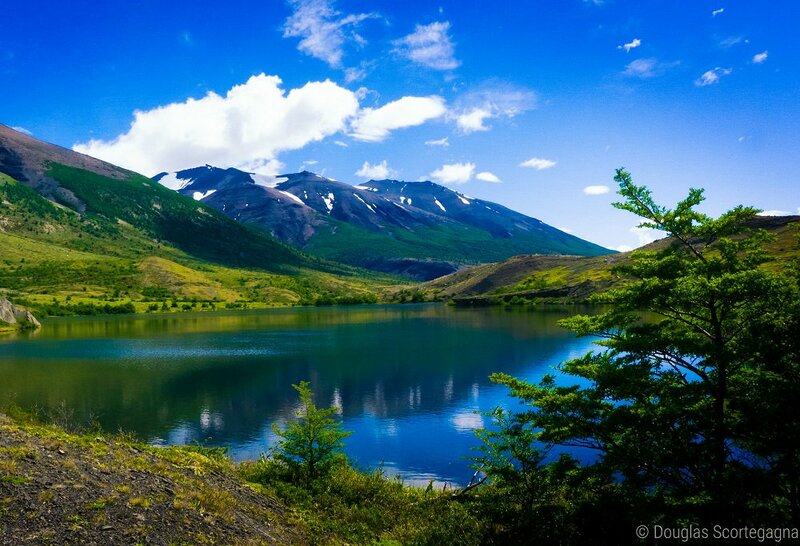 Nonetheless, a similar picture is evident. As shown in the right panel of the above chart, China’s ratio of household debt to total disposable income ranges from roughly 80 percent to 110 percent, depending on the measure of income. This range is broadly comparable to the ratio in the United States and the median for countries in the OECD (113 percent), but is well below Korea (170 percent). The next chart shows an estimate of China’s household debt service ratio (principal and interest) relative to disposable income (DSR), where we compute China’s DSR comparably to the method used by the BIS (specifically, we use the five-year nominal interest rate in China and assume an 18-year average remaining maturity on debt). 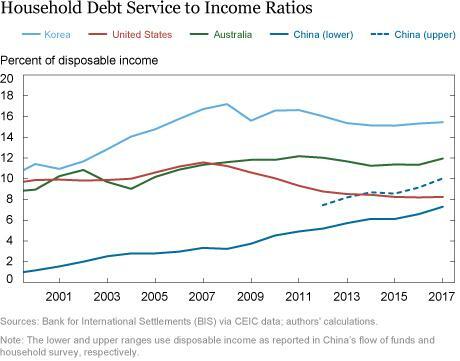 Based on this metric, China’s DSR is comparable to the United States, and is catching up to some other countries where household debt is often viewed as a concern among policymakers and market participants. Overall, the risks related to household debt in China are generally viewed as manageable by most observers. However, it is important to caution against being overly sanguine, especially since aggregate measures of debt and income may mask important differences among households. In fact, some household survey data already paint a more worrisome picture. For example, a recent working paper using micro-level data from 2015 suggests that a quite large proportion of Chinese households with debt outstanding to formal financial institutions—that is, excluding informal borrowing—already carry high debt service burdens. One of the metrics used in that paper to define a high burden are households with DSRs exceeding 0.4, a commonly used cutoff for identifying highly indebted households. The authors’ data show that 25 percent of indebted households carried DSRs exceeding 0.4 in 2015. Though it is difficult to make direct comparisons due to data and methodological differences, these figures appear rather high in an international context. The fraction of indebted households in Spain with DSRs exceeding 0.4 was 16.5 percent in 2008, while the proportion in the United States peaked at 14.8 percent in 2007 (using gross income). China’s figure is even comparable to that in Korea, which was 23.5 percent in 2017. Partly attenuating the Chinese figures are the facts that income may be understated in the survey data, and that relatively small fractions of Chinese households report negative net worth. The fraction of households whose DSRs and debt-to-asset ratios jointly exceed 0.4 and 1, respectively, has increased rapidly from a low base, but was about 1.2 percent in 2015, still well below the 3.1 percent in Korea reported in the Bank of Korea’s Financial Stability Report. The impact on growth and consumption dynamics of household debt are complex, but some research suggests that fast increases in household debt entail trade-offs between faster, near-term GDP growth and slower growth in the future. 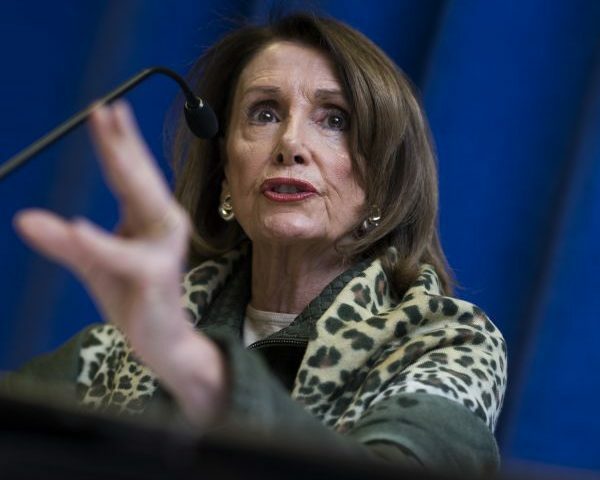 For instance, a one percentage point increase in the household-debt to GDP ratio would lower economic growth in the long run by a tenth of a percentage point, while some other research has found somewhat larger reductions in growth over shorter forecast horizons. The results suggest that the negative long run effects tend to kick in at GDP ratios ranging between 60 and 80 percent, which China is on track to reach fairly soon, as illustrated in the left panel of the chart below. In addition to the growth outlook, the rapid increase in household debt also raises issues from a financial stability perspective. Given the rise in mortgage loans and growing concerns with an overheated housing market, the property sector is a key watch point. Property has become the most important store of wealth in China, with alternative investment channels for household income still developing or under restrictions. For this reason, Chinese authorities view the housing sector as a key risk to financial and social stability and are likely to ease macroprudential policy in the event of a significant downturn in home prices. Limits on initial loan-to-value ratios are an important macroprudential tool in China, which provide some insulation to financial institutions and households in the event of shocks to house prices, incomes, or interest rates. The majority of mortgages in China are floating-rate loans, although benchmark interest rates are not adjusted often. Although loan-to-value ratios are increasing, they are generally low at around 50 percent on average; securitization of mortgage loans is also quite limited. Other direct and indirect risks related to the rise in household debt in China also stand out and bear close monitoring. Household lending is being driven by small- and medium-sized banks, as shown in the right panel of the above chart, which are typically less well-capitalized. These banks are increasing household loans at roughly 30 percent, on average, compared to 20 percent at the larger banks. 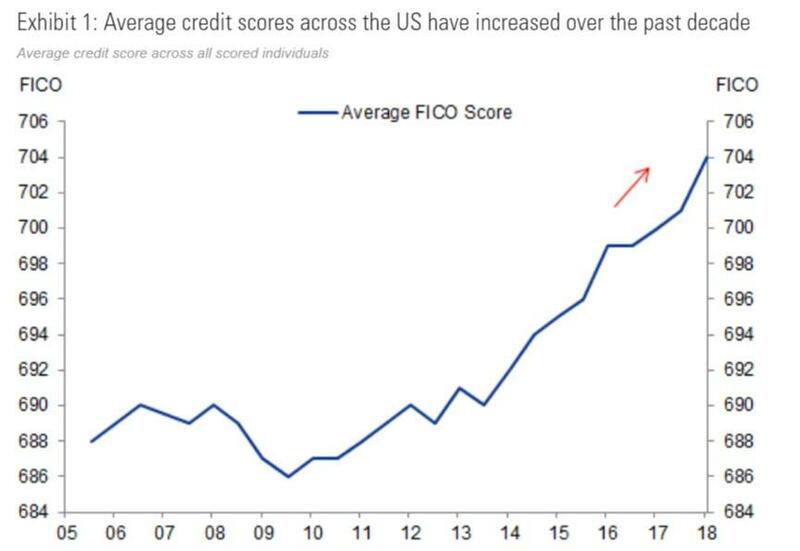 The pickup in nonmortgage household lending (for example, credit cards and other consumption loans) may be adding additional leverage to borrowers of both mortgages (for down payments) and unsecured revolving consumer credit (from online peer-to-peer lending platforms). This additional leverage is of particular concern for the roughly one third of household debt that is estimated to be held by highly indebted households (those with debt-to-income greater than four times). It also suggests that a deterioration in the balance sheets of these households could have a negative impact on the banking sector as well as on the economy, a risk highlighted by the International Monetary Fund in its October 2017 Global Financial Stability Report.